There’s a joke towards the end of The Lego Movie 2: The Second Part about the perils of Lego and bare feet that gets a pretty substantial laugh from the audience. I laughed too, but that joke also is symbolic of the entire movie – sure, it’s funny, but it’s also familiar. The Lego Movie didn’t rely on jokes like that to be hilarious, and I give Phil Lord and Christopher Miller a ton of credit for the magic and imagination of that movie. There’s a lot of magic and imagination in The Lego Movie 2 as well, but it was always going to have to fight against the law of diminished returns. Everyone expected the first film to be a giant toy commercial. No one expected that it would have so much to say about childhood, consumerism, the sheer joy of playtime, and wonder. It was a happy surprise to everyone, and I still contend that The Lego Movie is one of the finest American animated films in the past 10 years. So The Lego Movie 2 simply can’t live up to the highs of its predecessor, but that doesn’t mean that it doesn’t reach some substantial heights in trying. It still has a lot to say, only since we understand this world more, we’ve grown more accustomed to the story. We know there will be a big reveal, and a lesson to be learned, and everything will be awesome in the end, even if we’re not certain of the particulars. Families will love it, and they should. The messages are valid and worthy. But I fear that, in the end, there isn’t much more these films have to say. WhatThe Lego Movie 2 does that works exceedingly well is that writers Lord and Miller dive straight into the story established at the end of the first film: the Lego World that we know has been irrevocably changed by the Duplo, and now that Finn has to play with his sister, that shift is reflected in Emmet (Chris Pratt) and Wyldstyle’s (Elizabeth Banks) world as well. Devastation is everywhere, and when an alien ship shows up and takes away Emmet’s friends, Emmet is compelled to rescue them. Emmet teams up with oddly familiar Rex Dangervest to help his friends out, but not everything is as it seems, and Emmet must decide just how much change he’s willing to accept. Unlike the first film, The Lego Movie 2 is much more of a full-blown musical, and the songs are welcome and fun. If it took months to get “Everything Is Awesome” out of your head, it should take a heck of a lot longer to get these out of there, especially “Catchy Song” and “Gotham City Guys.” Plus, the songs advance the story well. The new characters work too, especially Tiffany Haddish’s Queen Watevra, who may or may not have nefarious plans for Emmet, Wyldstyle, Batman (Will Arnett) and the gang. The cameos are just as fun as the first time, with some new ones thrown in. The Lego Movie 2 has a lot on its mind. Some would say it may be overly burdened with themes, not only about growing up, but how to accept change when it comes, and even that it’s fine when everything is not awesome and when it examines how children deal with difficult times and situations. But, since we’ve seen this before in the first film, it doesn’t come as much of a surprise this time around, and those striking moments in the third act of The Lego Movie aren’t so striking when we see it done again this time. That’s not to say those moments aren’t emotional in their own right, only that it feels diluted somewhat. The funniest moments are when The Lego Movie 2 bounces away from the first and isn’t so beholden to it. The voice cast is definitely having fun, and my favorite sequence – a musical number between Will Arnett’s Batman and Tiffany Haddish’s Queen Watevra – gives u a Batman that we have never really seen before. 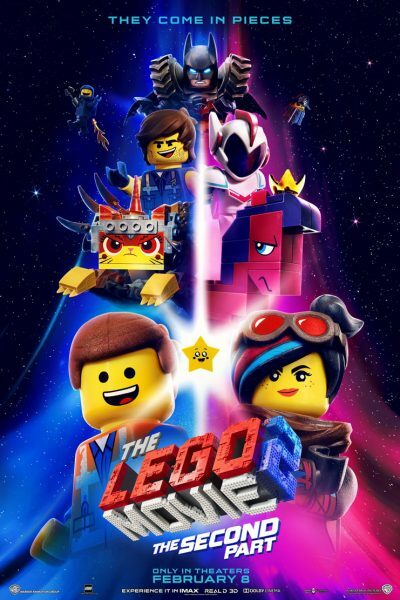 Audiences will find a lot to enjoy in The Lego Movie 2, but if the film doesn’t quite stick in the heart and the soul as much as the first one does, well, it’s to be expected in a sequel like this. 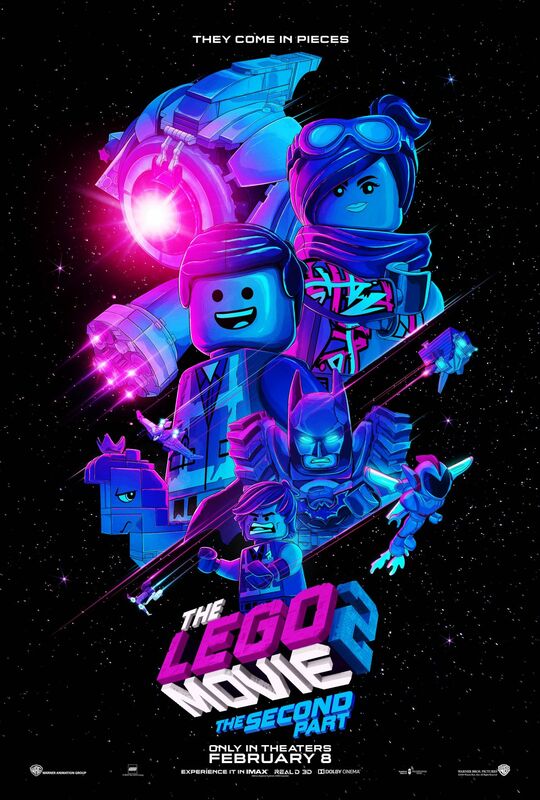 The Lego Movie 2 covers a lot of the same ground as the first movie, but since it’s still as entertaining as it is, audiences probably won’t mind. I don’t know how much more Lord and Miller can explore this territory, though. If the first one didn’t feel seem like a toy commercial, The Lego Movie 2 definitely has some of that old “been there, done that” fatigue.